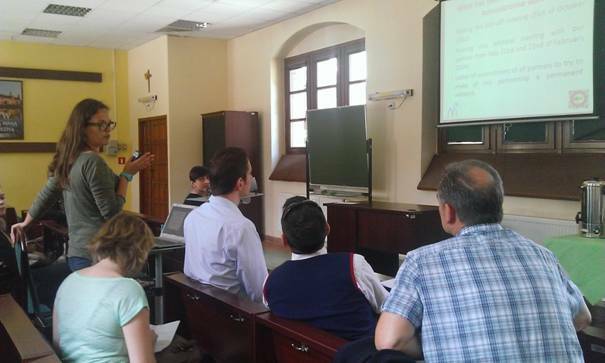 · Since the last meeting in Roma in last March 2014, the project coordinator has been focused a organisation a new biographical workshops in Wroclaw but also writing the science book that will be published soon and that is one of the main project results. · PSP has been very active in dissemination activities in local but also in international events. · IASIO has added a new language game of the GEM-project website. · IASIO proposed to start a Google adword campaign, but it would probably not necessary finally. · The focus of the association is to propose intergenerational activities and this way reinforce solidarity in today’s society. The use of ICT-tools is an important part of these activities. · Since the last meeting in Italy (March 2014) M3Cube has organized a new workshop with Stantlife that is a local company working with intergenerational memories in the web. This workshop was organized in April 2014 and the participants were very motivated to share the memories of the past remarkable events that have marked our history. · As a result, the partner organized small exchanges with the students in order to discuss the project topics and see their motivation to carry out this project in the future. · One important idea that they wish to share with the GEM-project partners is that if we continue the same project in the future, it would be more interesting to carry out same kind of workshops than in this project but emphasize that all the countries should have the same theme in the workshops, which would enable to compare better the results and the participants experiences in the different countries. · The evening craft school focused on three main areas in the project and targeting different generations: providing language training in English, proposing folk-dance courses as well as ICT-training. · Their main feeling of the intergenerational trainings was that it is not evident to gather different generations’ together in Turkey and to learn together. This is a process that takes time, but one the participants from the different generations open themselves for each others, the results are very encouraging. · HEM will continues this kind of intergenerational approach in their training. · ERIFO is a non-profit organization focusing on lifelong learning and they have a strong experience in European projects. · In the framework of the GEM-project, Erifo has organized several writing workshops with seniors with the aim to transcript their memories about the different stages of life. · All the writings are publicly available on the Little Memory Book blog website. After these presentations, Pro Scientica Publica from Poland presented their other ongoing EU-projects that are financed under the Leonardo da Vinci and Grundtvig programmes (such as Take part in Art and Games). · Write few points for Aneta why M3Cube would like to continue the GEM-project in the future. · Think about the new Erasmus + priorities such as improving the job perspective for seniors over 50. · An evaluation of the whole project will be created and filled by all the partners. · M3Cube will upload the French flyer on the project website (Mona will do this once Sergio has sent the new flyer version with the adapted logo and text). · Remove any indication regarding the WIKI platform on the leaflet. · Spain will correct the Grundtving logo and insert the correct one on our production. · Part E: will be written by Aneta (the project coordinator) by the end of July: the summary will be in English and the partners should translate everything in the own languages. + Poland will select the common results for all the partners. · Part F: each partner’s task, describe: mobilities, local activities, dissemination and impact. ð Aneta will send all the models by the end of July 2014. · EST database: Aneta will provide the common results in English; these should be translated and completed with the local results from each partner. · If a partner has ideas for the common results, this should be discussed with Aneta. · Partners agree that all the national links (for the common results) should be added, which demonstrates the active local involvement in the international activities as well. -Secondly, it was a great human experience which allowed me to meet different nationalities and to have the ability to discuss and exchange with different kind of people.